Which Captain will catch the most crab? 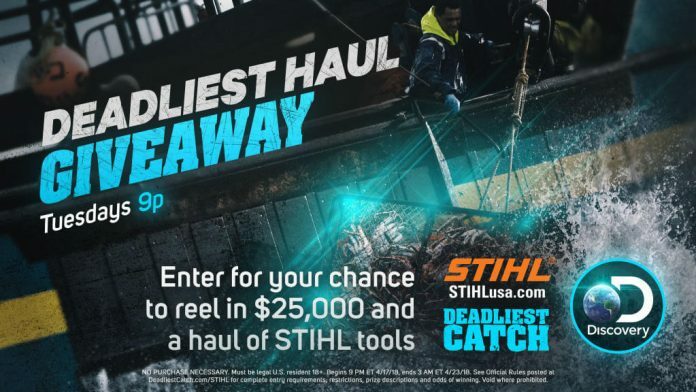 Discovery Channel and STIHL bring you the Deadliest Haul Giveaway to celebrate the new season of Deadliest Catch. Visit Discovery.com/STIHL and enter for your chance to win a $25,000 cash prize and over $1,000 worth of STIHL products. Register daily between April 17 and April 23 for more chances to win and watch Deadliest Catch on Discovery at 9p ET. The Deadliest Haul Giveaway is open to legal U.S. residents who are 18 years of age or older at the time of entry. The Sweepstakes begins at 9:00 PM ET on April 17, 2018 and ends at 3:00 AM ET on April 23, 2018, and consists of 6 Entry Periods. Access the Sweepstakes entry page. As part of the entry process, you will be asked to predict which Deadliest Catch captain will bring in the largest king crab haul during the Sweepstakes Period. Limit one entry per person/email address per Entry Period. On or about April 23, 2018, the Promotion Administrator will conduct a random drawing from among all eligible entries received during the Sweepstakes Period. On April 23, 2018, between 1:00 PM ET and 4:00 PM ET, the potential winner will be notified by telephone at the telephone number provided in the entry submission. Grand Prize will consist of $25,000 cash, which will be awarded in the form of a check made payable to the winner and a premium prize package from STIHL valued at approximately $1,210. Total ARV of the Grand Prize is $26,210. To receive the winner’s name, mail a self-addressed, stamped envelope to be received by May 31, 2018, to: Deadliest Haul Winner List, PMI Station, PO Box 750, Southbury, CT 06488-0750. Discovery Communications, LLC, One Discovery Place, Silver Spring, MD 20910.